Welcome back for my One Room Challenge Week 2 update! 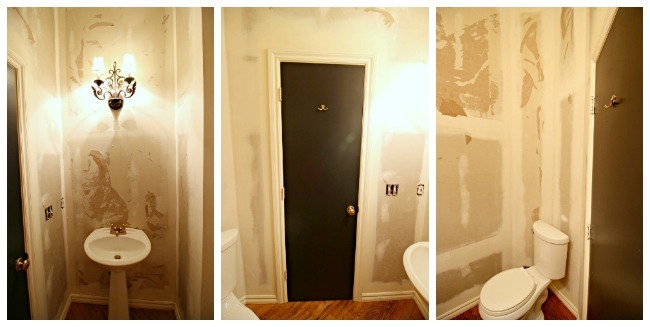 If you missed Week 1, I'm making over our Powder Bath and you can catch up here for all of the before photos. My space is small with an awkward layout and I'm working to freshen up the space from dark and dated to fresh and fabulous! Although I adore the Thibaut Tanzania wallpaper in the previous two images, the price tag is not in the budget. I'm planning to follow Pam's lead and DIY my own version for a fraction of the cost. How darling is her foyer? However, in my small room with 10 ft. ceilings, I didn't want the spots to be totally overwhelming, so I'm planning to break the walls up by adding a chair rail and some moulding. I stopped dead in my tracks when I saw this image on Instagram... how amazing is that railing pattern? 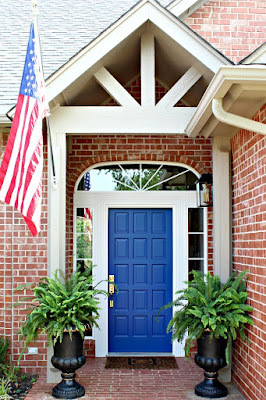 I haven't finalized my moulding design yet, but this is inspiring for sure! 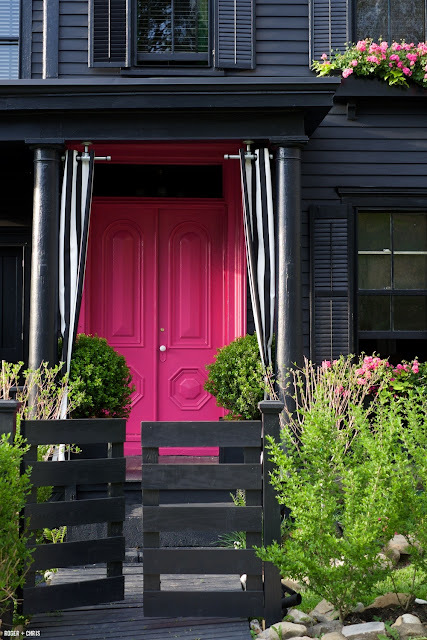 Finally, there's going to be a surprise pop of color in the room! I have a plan for the major components in the room, but the lighting, art, and accessories are still up in the air. Whatever ends up in the final reveal will be a surprise for us all. One thing is certain, it will be a little bit traditional, a little bit modern, a little bit glam, and a little bit quirky! And here's what happened this past week...stripping. Lots and lots of stripping. Wallpaper stripping, that is. ;) You saw the red damask in the before photos, but this lovely forest green and burgundy stripe was underneath that. 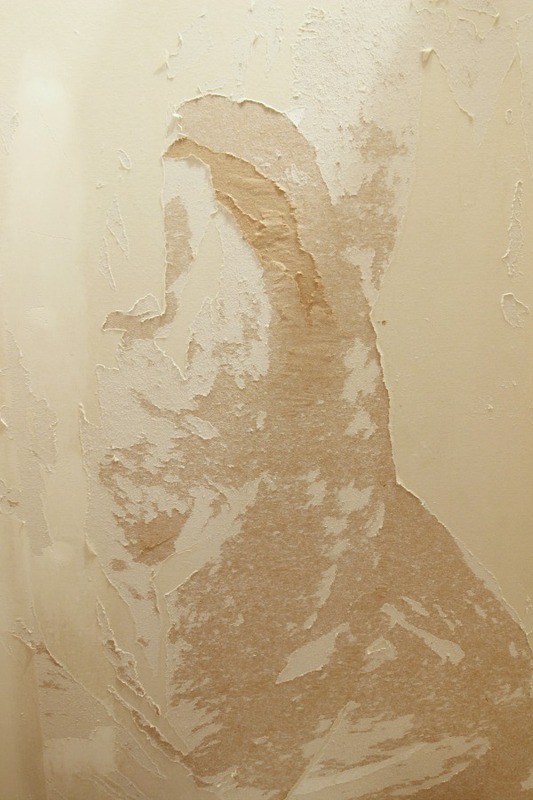 And of course, the wall was not properly prepared before the original wallpaper was installed, so as careful as I was the drywall was still damaged in many spots. Boo. So, the wallpaper is off, but now I'm waiting for my drywall guy to come and patch the bad spots before I can continue. I'm 99% sure I'm going to change the single light fixture to a pair of sconces, too, so that will need to be re-wired before I go much further, too. So, hurry up and wait is the theme this week! That's is for this week! I'd love to see you on Instagram for updates, you can find me here. That is a ton of work stripping wallpaper! So not fun! I am so excited to see this space come together! 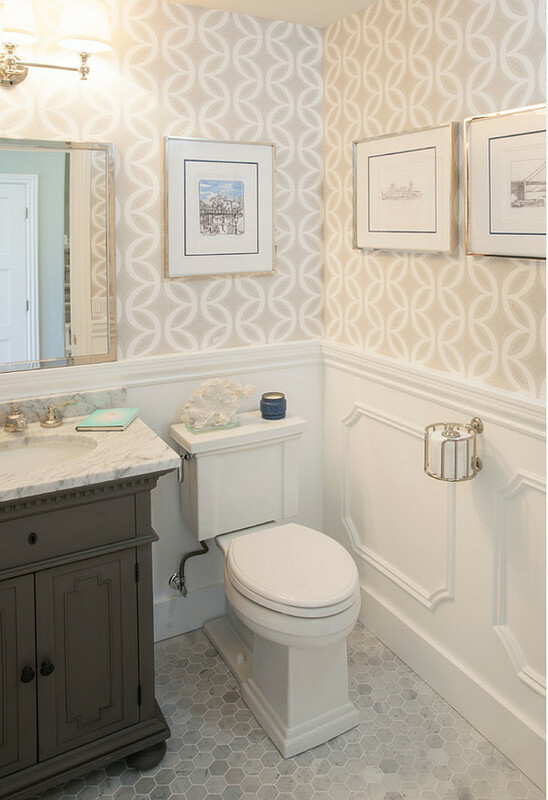 Can't wait to see how you're going to recreate that wallpaper look! Excited to follow along! Pam's foyer is what inspired me to use that in my little girls room! It turned out SO fabulous. It will look great in your bathroom!!!!!!! Oh Jennifer I am seriously so fired up to see the progress of this room over the next few weeks! 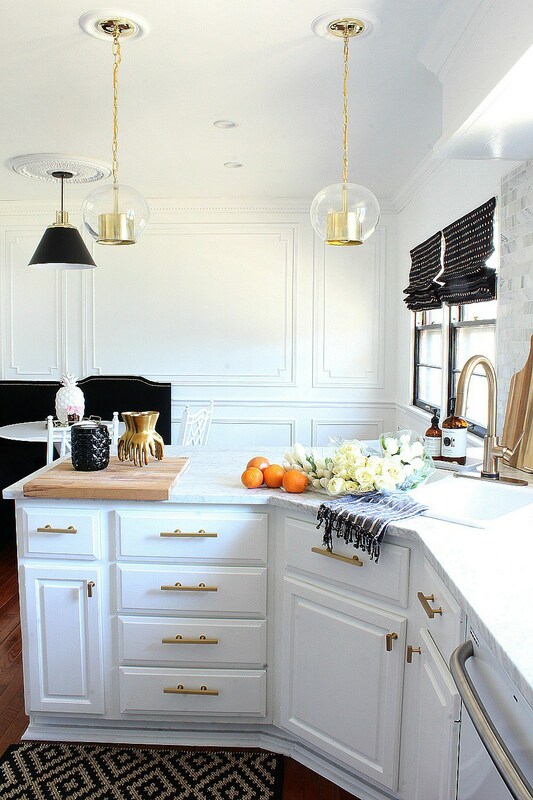 The new plan is so perfect for you and I love the surprise pop of color you're bringing in and the lucite and brass touches! This space is going to be so awesome Jennifer!! So excited to see this powder bath come together! Double wallpaper. Thanks, powder room. But man is gonna be worth it in the end. Very psyched about this design! Can't wait to see it all come together. Love to follow you and your One Room Challenges! They speak to my heart! Looks like a gorgeous plan! 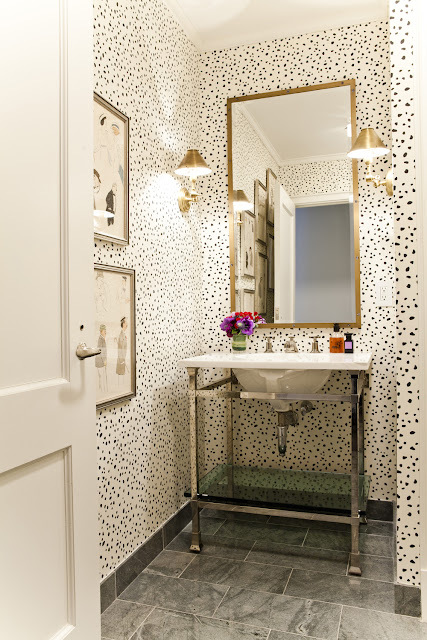 I used that stencil in my hallway and do just want to give the tiniest warning that the spots are way bigger with much more spacing between them in the stencil than they are in the wallpaper. It looks very cool, but most people call it a dalmation wall when they see it. I will add way more tiny freehand spots at some point to fill it up. There's also a quite good temporary wallpaper dupe out there that I've seen (I forget the designer, sorry!). Anyway! Will be beautiful no matter what but wanted to share that. I love your plan. So glad you are going to DIY the walls yourself. I did them in my closet with a little pot of black paint and a brush. So easy and it looks fabulous. 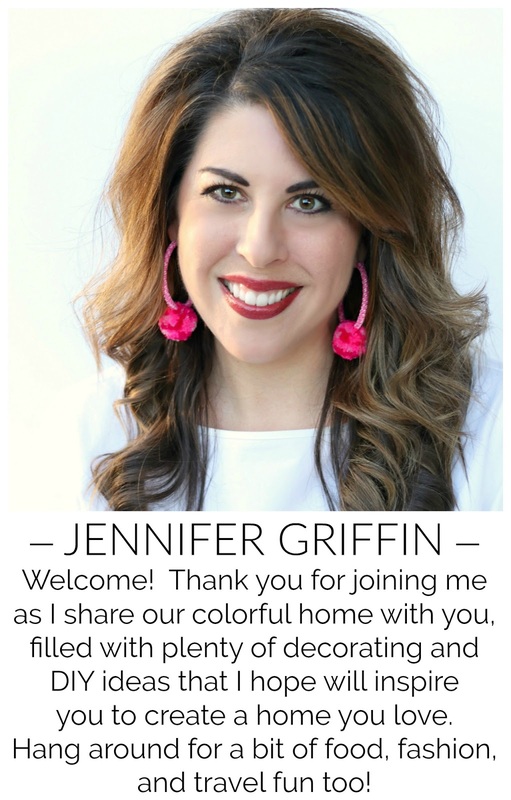 OMG Jennifer, your tackling quite a project with that wallpaper layers in there! I am positive this will be smashing! I just joined the ORC this week, and I hope I can catch up and finish on time! I love what Pam did in her room so I think your spots are going to look great in your bathroom. Can't wait to see more of your progress! Loving your plans! Now this bathroom is totally you! You get a gold star for getting all the wallpaper off!!! Good luck this week!! Swoon! Your plan is absolutely divine! I'm dying!!! I'm so excited to follow along as you implement this design. 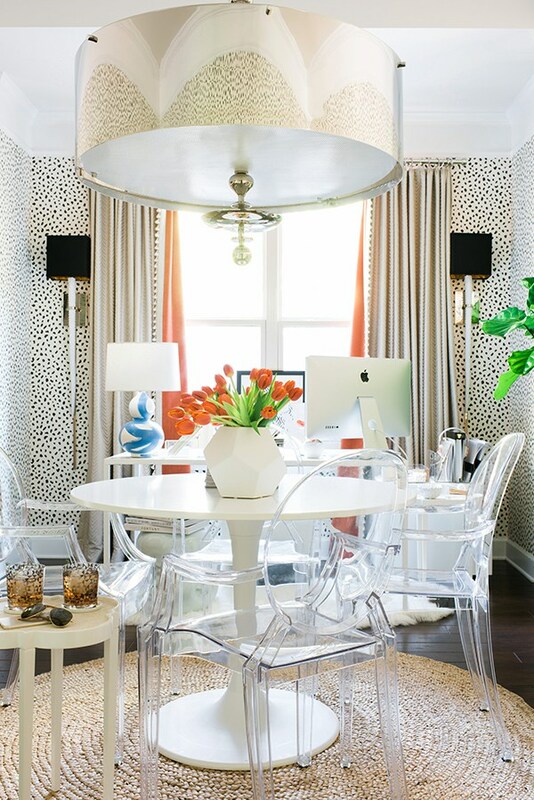 I just love your style and your fearless use of pattern and color. Ohh love the idea to DIY it & double sconces! Can't wait to see the space come together! I have been eyeing that wallpaper forever! I love it. Can't wait to see your finished room. Oh, I bet I know exactly what's happening with that fabulous pink! :) Can't wait to see it all come together. Thanks for the sweet mention, too! This is going to be insane good Jennifer! Can't wait! Yay, it will be so so good! That black house and pink door stopped me in my tracks. 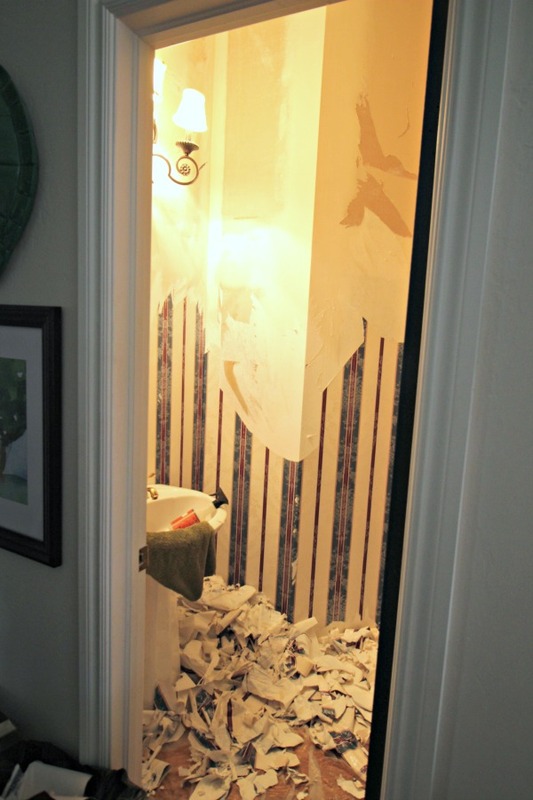 Man, I've been there with the wallpaper removal that pulls off half of the drywall - no fun! This space is going to be so Jennifer and so totally awesome! You might check out the wallpaper at Spoonflower. There are a couple of black dotty patterns. I can't speak to the quality...I just ordered a few samples and they're on their way. 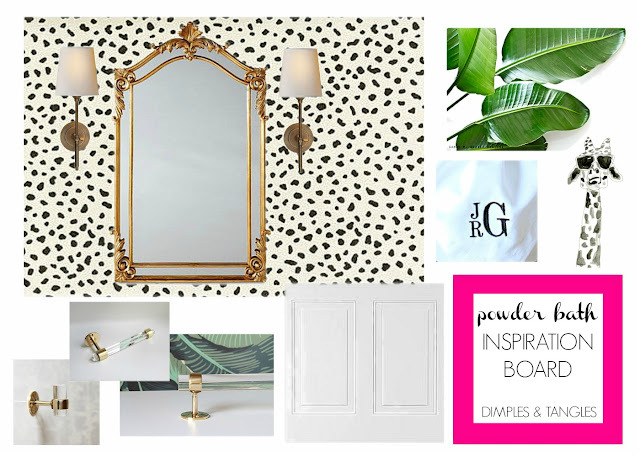 inspiration board looks fantastic! good luck! Your design plan is so great! I can't wait to see how it all shakes out! WOW!!!! Jennifer this is going to look great! I wanted to do the dalmatian pattern in my powder room a while back but didnt want to remove my navy wall color. Haven't found the perfect balance of dalmatian with navy, lol. This is going to be fantasic!!! LOVE it!